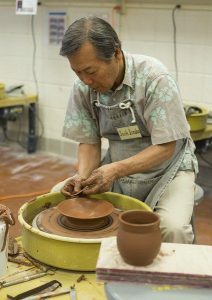 Home Uncategorized	Jack Iizuka Ceramics Demonstration! We are very pleased that master ceramicist Jack Iizuka will visit our studio on Tuesday March 20 for informal demonstrations and discussion. Jack will be here on island for one day only. Born in Ichihara City, Chiba Prefecture, Japan, Iizuka is a master at the sgraffito technique, which involves the etching and carving of intricate designs into ceramic surfaces. He holds a master’s degree in ceramics from California State University and a bachelor’s degree in art from Loma Linda University. Jack will be in the ceramics studio around 10:30 until early afternoon followed by pot luck. Stop by for inspiration and amazement!